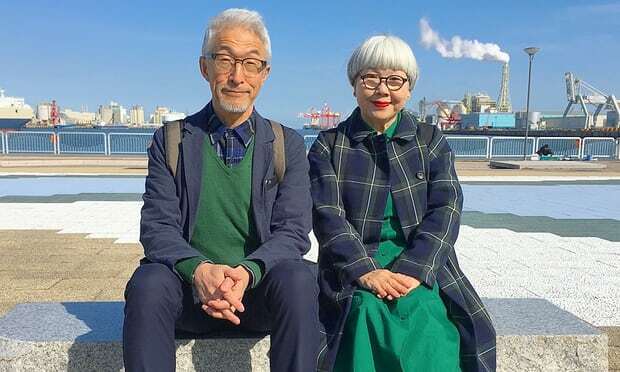 I first read about this Japanese retired couple sometime ago in one of the online Japanese news sites. They are now in the British news (The Guardian - you can see more photos there). Since 2016, they have dressed in coordinating outfits and posted to their Instagram account, which now has almost 720,000 followers. They are starting their own clothing line in a Japanese department store. The retirees were college sweethearts and have been married 38 years. While I would never dress in coordinating outfits with another person, spouse or otherwise, I do find the couple adorably cute. What about you? Do you and your spouse dress alike? Would you like to? o my, this is adorable. 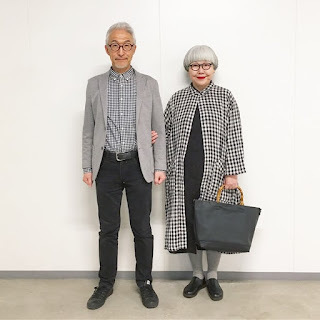 My husband and I like to match (colors) although we usually just settle for not clashing haha~ We have one plaid shirt in particular that we like to wear together in the fall/winter. I saw them on TV. I think they look adorable and a true couple. There is something very charming with signs of love between elderly people. Having said that, I don't think I and my husband would ever dress alike. They do look like an adorable couple! But I spent my childhood being dressed the same as my sister. Then came school uniforms which meant being dressed the same as hundreds of other people. Now the thing I love about making my own clothes is that I know no-one else in the world has the same outfits as me. Not for me, hubby is super casual, as am I but would not like to dress the same as him. Such a cute couple. But no, I think I would never like to dress like my DH - and he wouldn't like to dress like me, lol. They are SO sweet. You know, there are a whole lot of days that Terry and I unknowingly select the same color T-shirt to wear and people often comment on it. I don't know. I might like to dress similarly to Terry, at least the same colors work fine. They are incredibly cute, but some of their outfits still make me shudder, haha! The upper one you posted is gorgeous though. I like how sometimes the 'matching' is really subtle.